To escape dragon creatures, a young father leaves his family and travels across the ocean to a fabulous city, full of helpful animals and exotic food. There he makes many friends, all of whom also came to the city looking for better lives, free from oppression and war. After some false starts the man settles himself in his new life, but will he ever see his family again? 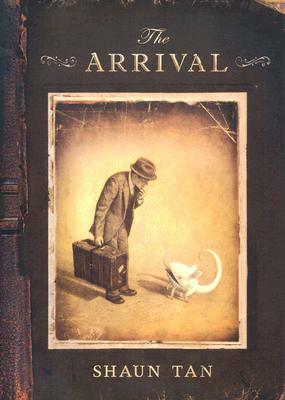 It seems like I've been wanting to read The Arrival by Shaun Tan forever, ever since I first heard about it on You've GOTTA Read This, but my library didn't have it at the time, and then I forgot about it. Fortunately, thanks to A More Diverse Universe, I remembered! The Arrival is unusual in that it doesn't contain any words. Instead, everything is conveyed through pictures. Personally, I didn't miss the words at all--I didn't even realize there weren't any until after I'd finished! The book has a very cinematic feel, almost like a storyboard, and is a great mix of the familiar and the fantastic. Although The Arrival is a secondary world fantasy, that's not immediately apparent, and the story itself is one that's easily relatable to any immigrant or descendant of immigrants. Even though the basis of the story is firmly planted in a familiar story, the fantasy elements don't feel out of place or gimmicky. Tan uses them to great effect to convey elements and emotions that, if The Arrival was told "realistically," would be too complex for this format. Instead, the fun animals, exotic setting, and shadowy monsters efficiently tell us very important things about this world and the characters' journey. As for the art, I LOVED it. It was very surrealism-meets-Dark City. Tan's drawings remind me of one of my favorite artists, Remedios Varo, in that I could see the influence of artists like Hieronymus Bosch and Odillon Redon, along with a quirky sense humor. Aside from all that, though, The Arrival is a super-sweet story. I adore stories about people who travel and make friends. Basically there is nothing not to like in this book, aside from maybe the fact that it was so short! I highly recommend this, especially if you also happen to like The Invention of Hugo Cabret by Brian Selznick (review here). It's really lovely. Check out the other stops on the A More Diverse Universe Blog Tour and celebrate POC authors in science fiction and fantasy!